Ooohh.. 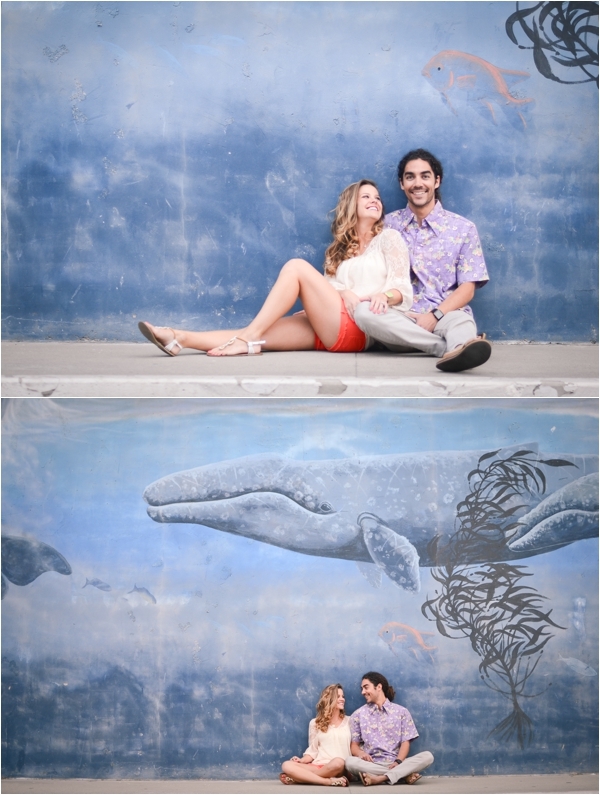 I just love the feel of this Oceanside engagement session by Jessica Lee Photography. So casual, so sweet.. with a couple so in love. Thank you Jessica for sharing this session with me! 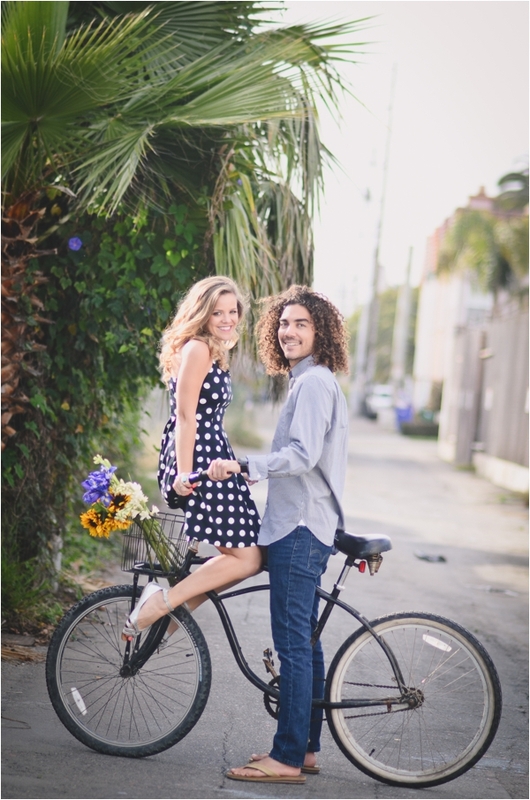 Their love story: We were both studying abroad in Madrid Spain in 2006. We didn't know anyone in the group but had decided to go on an excursion the second weekend into the trip. The destination was Portugal and everyone was taking the train. I (Lindsey) was late to school that day and had missed the opportunity to get train tickets. My friends had suggested I take the bus and that a fellow student named Kyle was taking so I wouldnt be alone. The next thing I knew we were on our way to Lisbon laughing and chatting on this bus with a bunch of foreigners drinking wine and falling in love. We were pretty keen on each other throughout the rest of the trip. Traveling to Sevilla and the Canary Islands were just a few of the places where the romance got even more apparent. I have never felt more myself around someone especially being emersed in a different cultures. Once our schooling was finished and we were back in the states we continued to date. 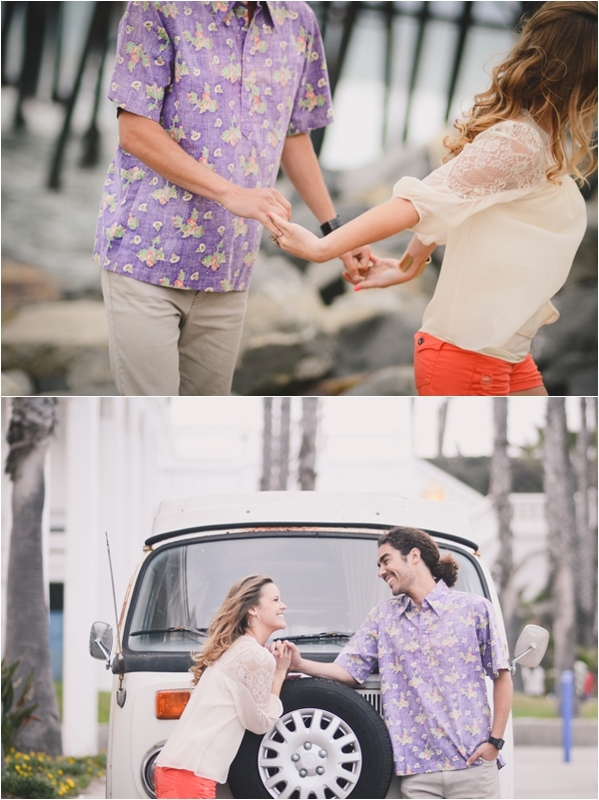 Kyle finished college at UCSB and I went to SDSU where we did long distance for about 2 years. We continued our European way of living by taking the train back and forth to see each other. After graduating Kyle and I followed our hearts back to Spain. We made our own English school in San Sebastian. It was a success! We managed to make enough to live and travel in Europe for over a year! We are quite the traveling pair, having been to Barcelona, Canary Islands, Holland, Germany,Biarritz, Paris, and all of Spain not to mention avid campers. Now we are back in the states anticipating our future travels and love for culture. I am so blessed to share the beauty this world has to offer with such an amazing person! 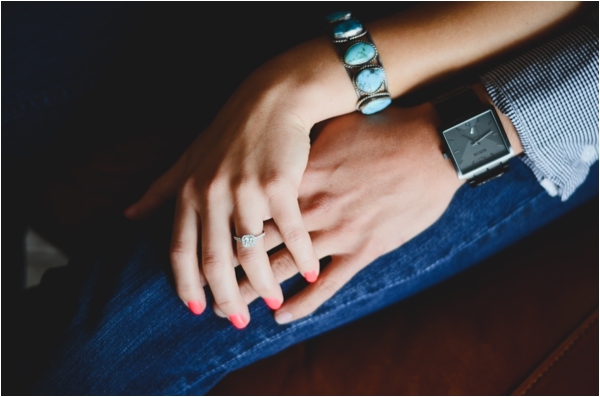 The proposal: Kyle and I were headed for a camping trip to Big Sur, California. As we were driving through Santa Barbara (right where kyle used to live) we wanted to walk "our" trail which overlooked Goleta beach. It was a gorgeous day out, and Kyle had conveniently brought a blanket for us to sit on as we watched monarch butterflies fly by and dolphins play in the water. Kyle grabbed a stick and said we should carve the date in it so we would always remember this day. I was clueless, but he continued to say, " I 'm going to get my pocket knife out of my backpack ..." . It was a total diversion. He was reaching in to get the ring!!! I looked at him (still clueless) and he told me things that I will never forget. He then got down on one knee and asked =). As if that wasn't enough he had one more surprise! He had a chilled bottle of champagne in his backpack and popped the cork over the ocean. I was ecstatic!!! I still get lost in the memory of that day. 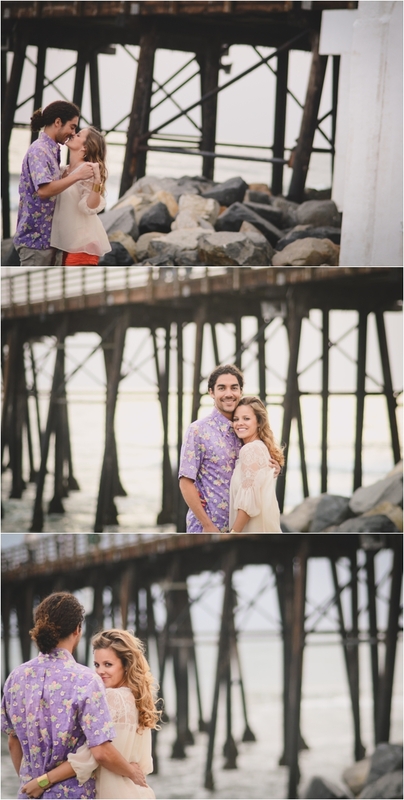 About their engagement session: We decided to take our photos right where we live in Oceanside. 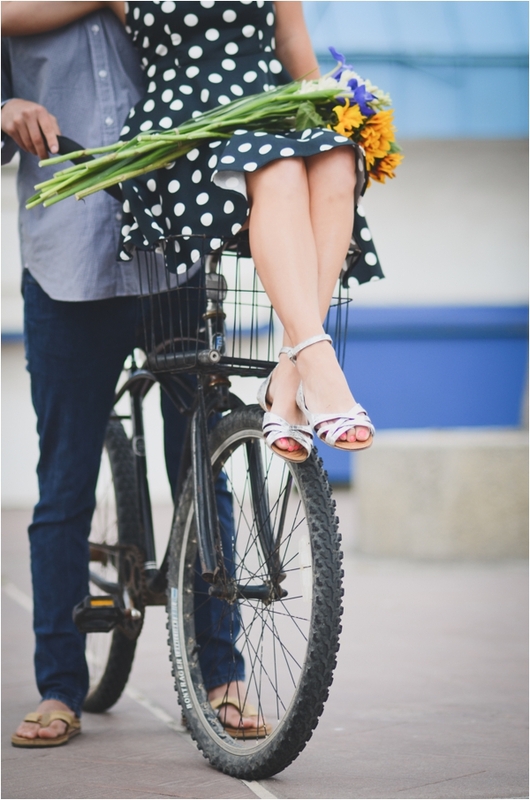 Our favorite thing to do is walk around the farmers market buy fresh flowers and mozy around town. We usually finsh our evenings with a romantic walk on the pier. So, we did just that! We had the super fabulous Jessica Thomas who is THE best photographer ever. Not only does she take great pictures but the woman behind the camera is where the great work comes from. She has a way with people that makes you feel as if you have known her for years. Her goofy personality and knack for the perfect photo-op exudes throughout her photos. She makes you feel comfortable and in the moment. Her passion for love and people is beyond what many are capable of. I am so happy we found Jessica she has a personal touch that you won't find in any other photographer.